Wacissa, FL--The Wacissa River is always a beautiful river. The river is spring fed and exceptionally clear. Wildlife is plentiful, especially birds but there is a growing alligator population. The river offers few spots to get out of the can oes, but it is not a tough paddle from the head spring to Goose Pasture, a distance of nine miles. 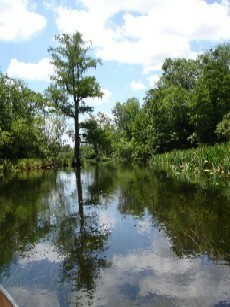 Beyond that, there is the slave canal which provides some challenging pull-overs as one traverses the canopied waters. The 2005 Memorial Day trip was such a delight that the Fellow Travelers decided to make it an annual event. Gloria and Donald met at Charlie’s house and boarded the Suburban Profane for the journey. 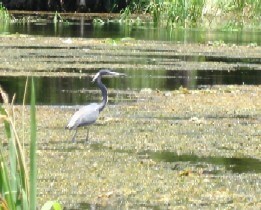 There was the usual stop at Hardee’s for breakfast, and then it was on to the Wacissa. Hamp was already there when the Moultrie contingent arrived, and the others arrived shortly. Si nce John Williams still did not have a full release from his heart surgeon, he was to ride with Art and Janice. Upon unloading the canoe, Charlie found that a bird had built a nest in the Penobscot 17, and there were two infant birds in the floor of the canoe. Hamp tried valiantly to save them, but they died before the start of the second day. Ten paddlers--Art and Janice Shelfer, Paula and Heather Allen, John Williams, Hamp Chauncey, Donald and Gloria May, and Diane and Charlie Stines--met at the head spring on May 27, 2006. to paddle to Goose Pasture. After running the shuttle, the boats were manned an d the paddle began. The weather was beautiful but hot. Paula and Heather were rookies, but they managed the Penobscot 17 (Gunn boat) like pros. 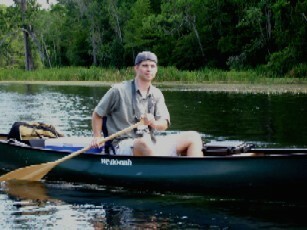 Hamp brought his new Wenonah Solo Plus for its maiden Fellow Traveler paddle. John rode with Art and Janice in the Penobscot 16, Gloria and Donald rode in Donald’s Mohawk Nova 16, and Charlie and Diane trudged along in the Canadienne. The journey began about 10:50. Hamp spotted a small gator within the first twenty minutes. There was a side trip to one of the large springs. Birds were everywhere, including a couple of osprey, lots of egrets, some gallinules including a few of the iridescent ones. Turtles sunned on the logs. More alligators were seen, though none were large. The group decided not to stop at Cedar Island, which is about two miles downstream. The character of the river changes at that point. The channel becomes narrower, and there are sections which are canopied. 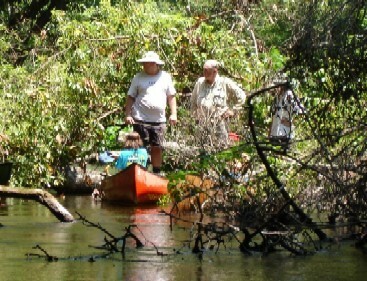 The flotilla crossed the remnants of the Wacissa dam at about one and then stopped at Pine Bluff Paradise for snacks. A stray cat begged for food, not without some success. John went wading and then got his foot stuck in the mud. The dam marks the approximate half-way mark to Goose Pasture, and the ten paddlers were underway again by about 1:35 PM. 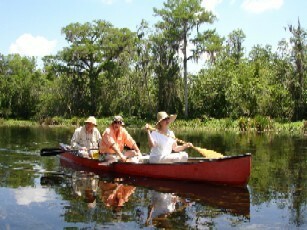 There were more birds and gators as the canoes continued the journey. About a mile and a half above Goose Pasture the river emerges from the trees and opens into a wide expanse of open water with trails through the aquatic grasses. There were birds aplenty, including some wood ducks. Edwin McCook of Suwannee River Water Management District had arranged for the travelers to have the group campsite at Goose Pasture. It is a major improvement over the regular campsite at Goose Pasture. There is a large shelter with several tables. 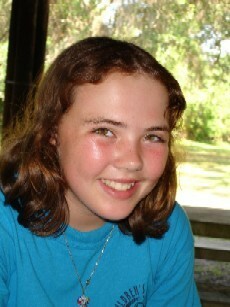 The shelter is shaded by huge oak trees, and there is a grassy field with room for dozens of tents. The slight wind eas ed the mosquito and gnat problem, but Art’s major award fogger was nevertheless welcomed. The Weatherman was also the cook. Art cooked catfish filets, and it was eaten with the coleslaw Gloria had brought. Charlie promised cheese grits but forgot to bring them, so he blamed Diane. It was well after eight when supper was finished, but the desserts were superb. John cooked a pineapple upside down cake in his Dutch oven, and Diane had prepared a churn of vanilla ice cream which was mostly cranked by Heather. After that, it was time to settle down and listen to the karaoke from the regular Goose Pasture campground. It was accompanied by the drone of gasoline-powered generators. Luckily, the group campground is far enough away as to let these noises be only minor annoyances. Finally, everyone sacked out in the tents. No one erected the rainfly, and it was a fine night for sleeping under the stars. Everyone awakened after daylight. Charlie made his twenty-cup percolator full of coffee, but Art was so long cooking breakfast that a second pot of coffee was made and drunk. Breakfast was Art’s super-secret recipe of egg hash with sausage, cheese, potatoes, herbs, and maybe a few more ingredients. Daniel Butler and Kathy Kinder had not been able to attend the Saturday paddle but arrived in time to share the breakfast. Daniel had repaired his Wenonah Sundowner which had been clipped by a tractor-trailer in January. The Suburban Profane was blessed with a flat tire, but it was changed. The spare was very low, but Daniel had a portable compressor to air it to specifications. After that, the vehicles were taken to the take-out and it was time to start the trip through the famed slave canal. The trip begins as a narrow trail through wild rice. The GPS markings were dead right, and the canal entrance was found in short order. The journey through the canal itself proved to be an adventure. The group had paddled less than fifteen minutes before reaching the first of numerous pull-overs. There were also some trees across the canal which could be floated under, although some canoes were more suited to this than were othe rs. Heather rode with John and Art, and they flipped. Paula took it as an attempt to drown her first-born, but Heather (a rising fifth-grader) was a real sport. After negotiating the canal, the Fellow Travelers reached the junction of the Aucilla River, paddled upstream a few hundred yards, and disembarked. Hamp had a watermelon ready. Once the boats were loaded, everyone headed home. John was blessed with a flat tire before he reached the head spring, but he did manage to find some rock souvenirs for Cindy. It was a grand trip, one that was reasonably short and not too tiring. If there is a Memorial Day trip in 2007 it will probably be scheduled for Sunday and Monday so that the travelers can attend the Florida Folk Festival at White Springs to hear Dave Lippy play the dulcimer and hear Roy Moye tell tales. With that, perhaps the Moyes and Lippys can make the Fellow Traveler outing.